Located opposite Pentrebach train station and just 2 miles from Merthyr Tydfil town centre off the A4060 and A4054. 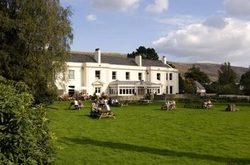 Cardiff is just a 25 mile drive away and this Premier Inn makes a great base for exploring the beautiful Brecon Beacons. Facilities include free on-site parking and a Table Table restaurant serving fresh quality food throughout the day. Book direct for the best Premier Inn Merthyr Tydfil deals.